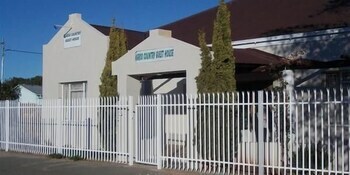 Located in De Aar, Karoo Country Guesthouse is within a 15-minute walk of Nederduitsch Hervormde Church and De Aar Park. Free self parking is available onsite. With a stay at Ambrosia Guest House and Spa in Centurion (Die Hoewes), you'll be within a 15-minute drive of UNISA and Voortrekker Monument. Free self parking is available onsite. When you stay at Lalaria Lodge in Ballito, you'll be near the beach and within a 5-minute drive of Thompson's Bay Beach. Free self parking is available onsite. With a stay at Appleby's Guest House in East London, you'll be within a 10-minute drive of Bonza Bay Beach and Eastern Beach. With a stay at L'auberge Country Hideaway in Port Elizabeth, you'll be close to Kragga Kamma Game Park and Holmeleigh Farmyard. Free self parking is available onsite. Located in Langebaan, 6 Spiti Mas Self catering is within a 5-minute drive of Calypso Beach and Langebaan Beach.